MB and assorted family did a run to the Tablelands today hoping to hand pick some fresh strawberries at Shaylee Strawberry Farm, and what a day for it, a clear and sunny 24c, just perfect. Only after arriving there did the team discover from the most unwelcoming pair behind the counter that picking starts in September. Not to worry MB asks if it would be OK to take little 4 year old LJ over to the strawberry plants so he could see how strawberries grow. Not a problem as long as you don't go past the multiple "No Entry" signs says Mrs Crabby. Upon inspection it's more or less impossible to see any fruit, however LJ skips past the signs and checks out the crop, under the eagle eye of Mr Crabby who had surreptitiously appeared from the back of the shop to monitor the trespassers. Grandma MB anxiously calls LJ back just in case a rabid pack of alsation guard dogs are unleashed from somewhere or other. 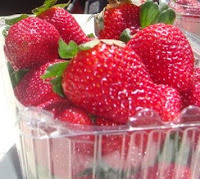 Strawberries were on sale, one kg of "Resort" strawberries was $12.00 and they are very nice. Won't be rushing back though anytime soon.